The process of creating application is described. 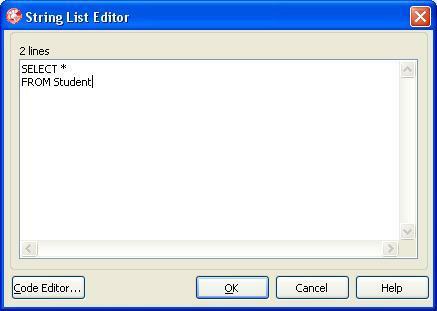 This application is used for the study of SQL-queries to the database. The database “01_02_00_011_mydb.mdb” is given. 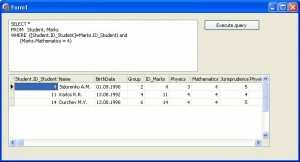 This database contains three tables: Student, Marks, Group. The structure of tables is the following. We need to develop the application, which will to form SQL-queries to database. Save the project in any folder. It is recommended to copy the database file “01_02_00_011_mydb.mdb” into folder, where are placed working files of our project. 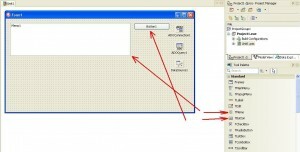 First, you need to increase the size of the form with the help of mouse. 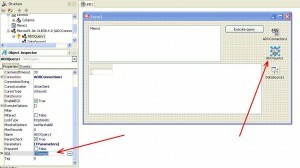 – from tab “Data Access” the component of type TDataSource (Fig. 5). As a result of executed actions, automatically will be created objects with the such names: ADOConnection1, ADOQuery1, Memo1, DBGrid1, DataSource1. 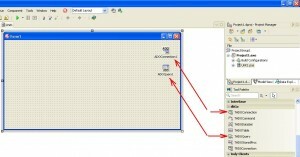 Connecting database to the application. 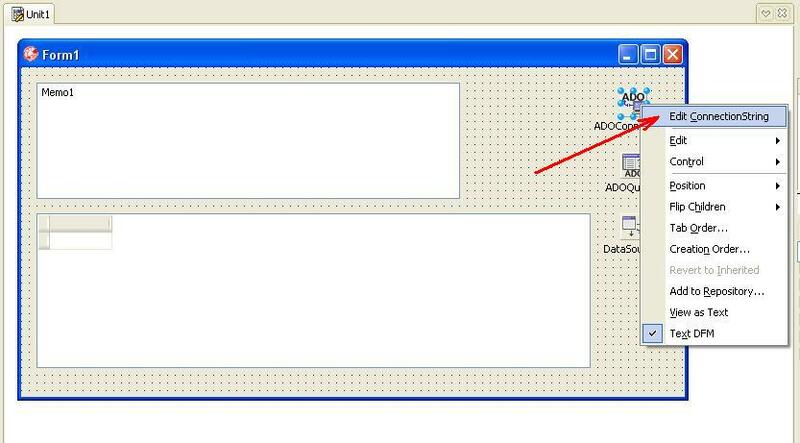 To connect database to the application, you need to call the command “Edit ConnectionString” from context menu, that will be called by click of right mouse on the component ADOConnection1 (Fig. 6). The process of connecting to database includes several steps, is realized as wizard and described in detail here. 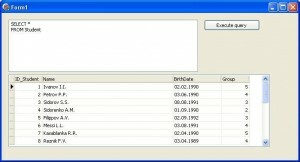 After connecting the database, you need set up the properties of other components, to get visualization of database. Setting up of properties of components. – in component DBGrid1 property DataSource set to value DataSource1. 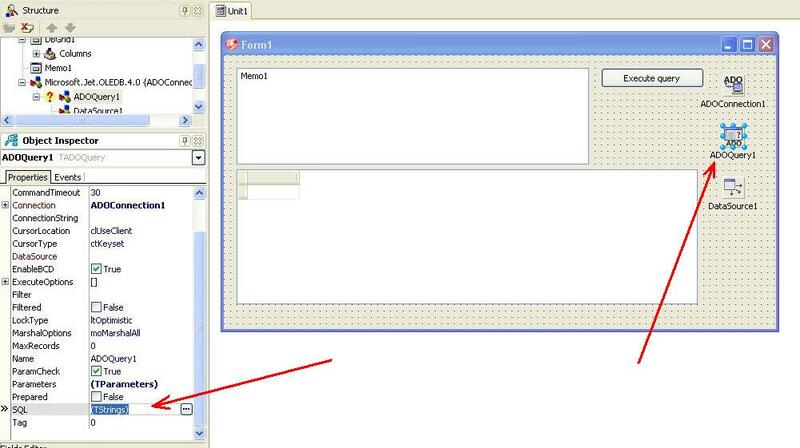 After setting up of properties of components, the main form of application will have view as shown at Figure 7. Now, the database is connected to application. 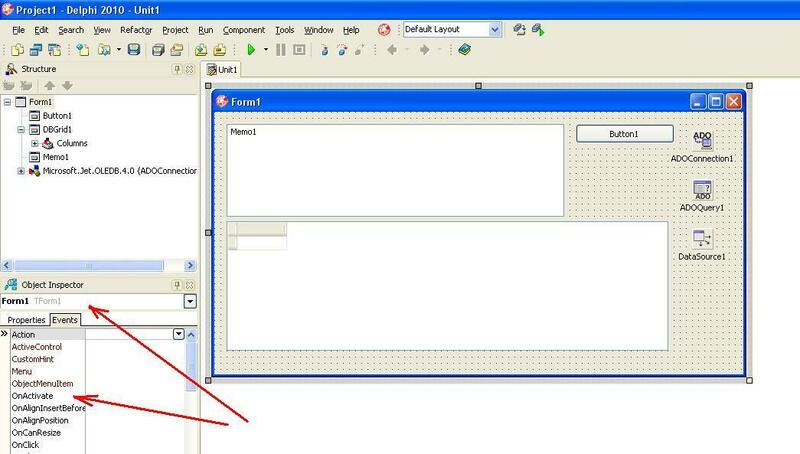 We can create the program code of form activation and the clicking at the button “Execute query“. 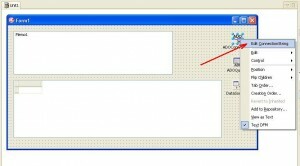 Setting up of property SQL of component ADOQuery1. 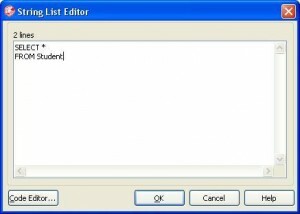 To input text of SQL-query, first of all, you need open the code editor at the SQL-language of component ADOQuery1 (Fig. 8). Programming the event OnActivate of activation of main form. We program the event of application form activation. This event is generated one of the earliest, therefore we need to write here the code, which initializes components. The detailed process of event programming in Delphi is described here. We select the main form of application and call the event OnActivate from tab Events in Object Inspector (Fig. 8). Listing of event handle is the following. The event programming OnClose of form closing. The event OnClose of form is calling when form is closing. 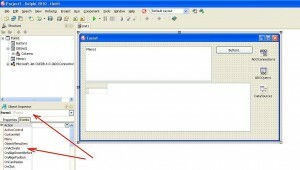 Therefore, you need to type the code of closing connection with database. In the event of form closing type the following text. This code checks the data set for the opening, and if this set open, it is closed by the method “Close” of component ADOQuery1. 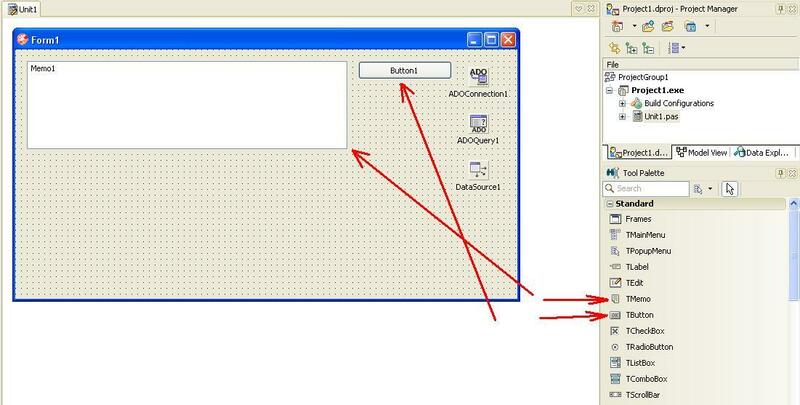 The programming of event OnClick of component Button1. 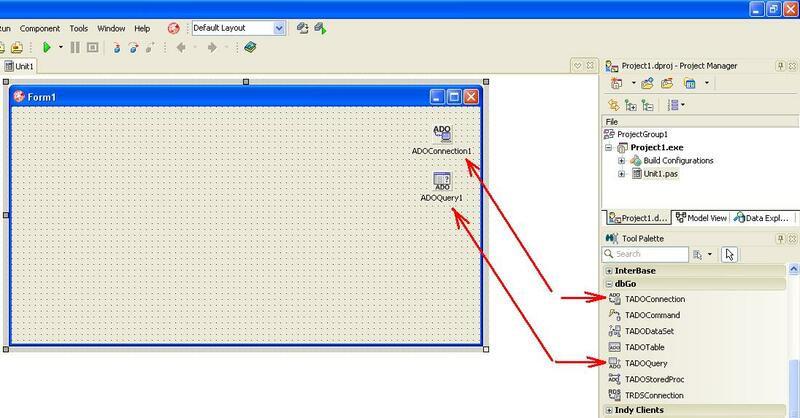 To give the command execute SQL-query into Memo1, we need to program the event OnClick of component Button1. The code listing of event handle is following. if ADOQuery1.Active then ADOQuery1.Close; // the connection closed? After performing steps, you can run the application. The result of application running is shown at Figure 11. As we see from Figure 11, the all fields from table Student are displayed. 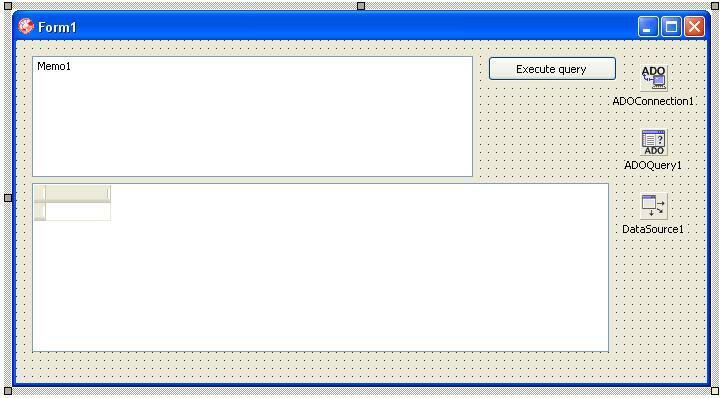 Text of SQL-query is formed in component Memo1, but result of it’s executing is displayed in component DBGrid1. Let’s create other SQL-query, that shows of students, which have the mark 4 of mathematics. The result of running of application is shown at Figure 12.